Heat oil. Sauté ginger, onion, and scapes 10 minutes. Add potatoes, and cook 10 minutes. Add all remaining ingredients except the chives and garnishes; bring to boil, turn down heat to low, and simmer for 30-45 minutes. Blend soup with immersion blender. Add chives. Ladle into 1-cup bowls, garnishing each with 1 ounce goat cheese, 1 piece bacon, and pinch lava salt. Note: Each bowl, garnished, is approximately 280 calories (180 without garnishes) and 15 g carbohydrate. Sounds like a great soup. Just a bit of meat can go a long way in soups making them more delicious without a lot of added expense. I've been having a creamy turkey gnocchi soup craving for a while now .... I should really cook that turkey in my freezer. The recipe on my blog. I adore scapes. They are the incarnation of tastiness. 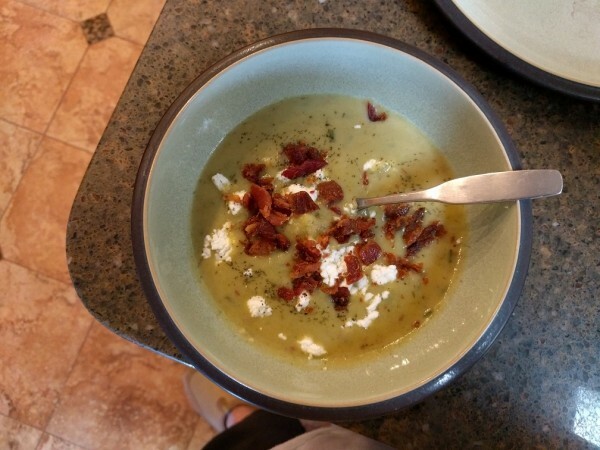 This soup looks great -- have printed the recipe for later experimentation.